Do You See What You Need to See? Would you believe me if I told you that Square A is the same shade as Square B? If I told you that you can’t trust what you see, and that indeed the squares are the same shade, would you believe me then? If I showed you the following proof (the two parallel strips are the same uniform shade – they do not change shading as you go up or down them), would you believe me then? Maybe a bit, but more than likely, probably not. 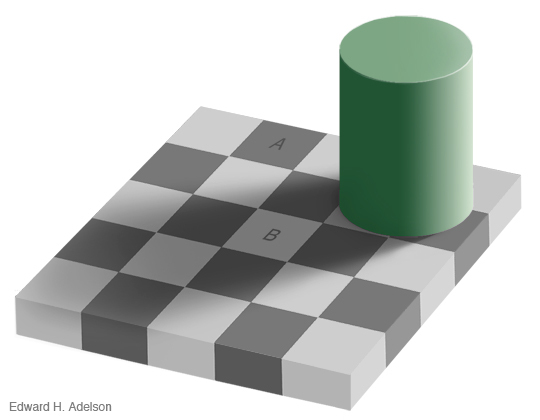 You’re likely still convinced that square B is lighter than square A. And if you still don’t believe me, you can see the proof here. And you still may not believe that. Part of being a successful leader is knowing when you’re right when everyone else is wrong. We all have images of the apocryphal lemmings heading off the cliff. But there’s equal value in knowing when you’re wrong, especially when you don’t know it. Like the squares example above, we’ve all had times when the feedback we’ve received about ourselves, our leadership, or our way of interacting with others was completely wrong. We were certain of it. Like the squares above, the more we listened to or read the feedback, the more certain we were that the persons providing it were completely mistaken. Absolutely. Positively. No doubt about it. 100% wrong. You can believe that the squares above are of different shades, and not much harm will come from it. However, if we refuse to accept feedback that contradicts our self-image, we do run the risk of, lemming-like, walking off our career cliff. 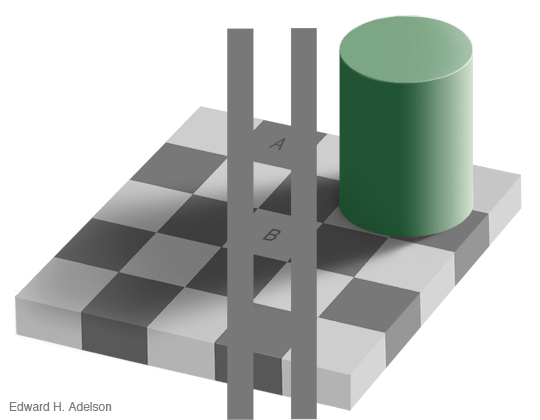 So the next time you’re with your direct report, and he/she is refusing to accept your or others’ feedback, share with them the squares illusion. Fundamentally, it’s good to remember, particularly if one is a leader, that being human means being wired in such a way that we don’t always see what we’re actually seeing. How do you help others accept feedback? Post your examples and comments below.